We're always telling you about great box services that deliver everything — the farmers' market, the corner bar, the indie boutique — to your door. We decided it was time to do our own food box. After all, we have strong opinions about what we eat when we travel. So we partnered with our pals at Mouth, the Brooklyn-based indie food purveyor, to curate the Bon Voyage Bites box, a special collection of Fathom-approved, travel-friendly snacks. 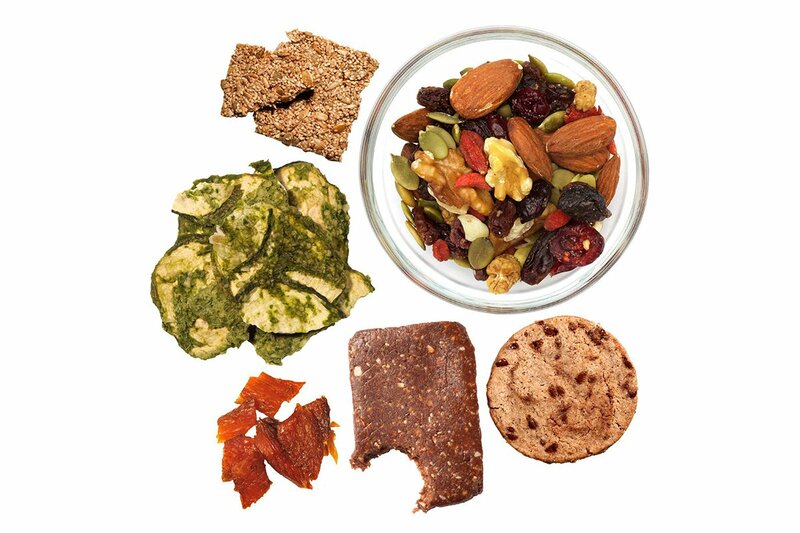 Like crispy veggie chips, awesome organic trail mix, salty-sweet seeded brittle, a flavor-packed energy bar, addictive smoked salmon jerky (lox in a bag! ), and chocolate espresso cookies (a quick caffeine/sweet fix). Buy it for yourself (for road trips, airline journeys, country picnics) or for a friend (way to send them off in style!). The go-to treats will make any journey tastier. And, yes, we even made sure everything is liquid-free and lightweight, so you won't get stopped in security — or be stuck with mediocre, overpriced snacks on board. Your carry-on overfloweth. Now hit the road, snack! Order your very own Bon Voyage Bites box for $41. Use the code Fathom15 until 1/01/2016 for 15% off your purchase.